California Prop 65 Warning: Prop. 65 Waring for California Residents. WARNING: This product may contain Chemicals known to the State of California to cause Cancer or other reproductive harm. If the bearing is crooked for example when you lay it on a flat table, it is not flat. Please don't worry. This is our self-alignment feature. These bearing are meant to have some play in them. When you mount them, just use the shaft to rotate the bearing into proper position, or if it is not out of alignment by much, the bearing will correct their own alignment once they begin to rotate. Because if the bearings were not aligned properly and spinning at high RPMs then sure disaster would happen. So our self-alignment feature is a way to prevent this from happening. 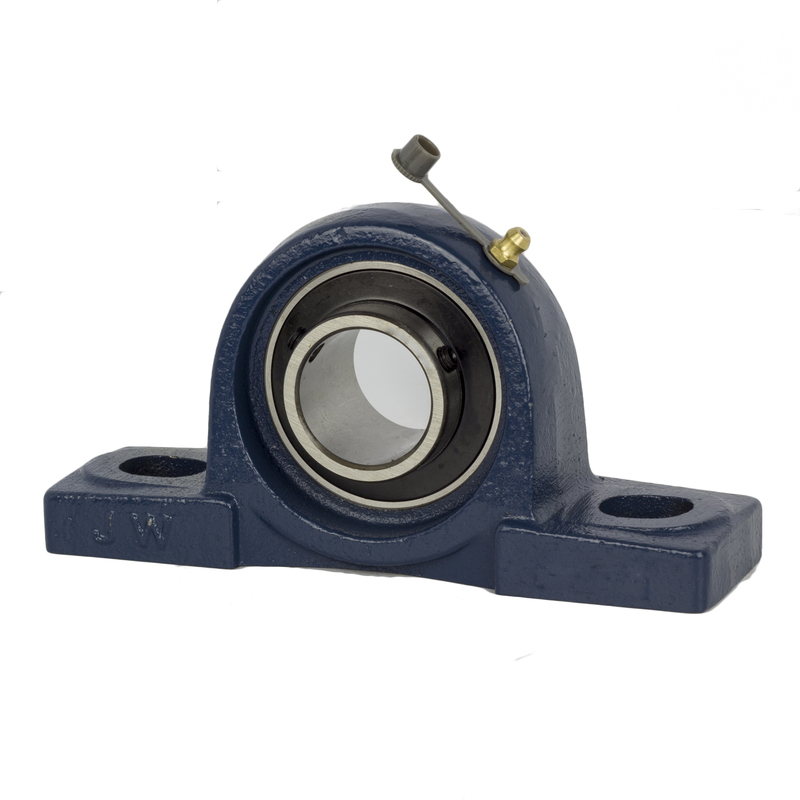 The UCP pillow block mounted bearing series has two bolt holes, and a set screw lock is designed for mounting onto bearing surfaces parallel to the shaft axis, such as conveyor belts. This ready-to-mount unit has solid base cast iron housing, chrome steel bearings, and is designed for efficient operation at a wide range of speeds. This one-piece pillow block housing allows for a stationary outer ring and rotating inner ring. Insert bearing maintains the separation between moving parts to reduce rotational friction, and to support radial and axial loads. The bearing is secured to the shaft with set screws to prevent slippage. This mounted bearing is used in food and beverage manufacturing, textile industry and many other industrial manufacturing. Jeremywell International, Inc. is a leading firm in power transmission and mechanical products. Our main products are Chains and Sprockets. We provide all varieties of standard and special chains, such as: Driving Chains, Conveyor Chains, Automobile/Motorcycle Chains, Agricultural Chains, Leaf/Hoisting Chain, Escalator Chains, Stainless Steel Chains, Metallurgical Chains and etc. Besides the Chains and Sprockets, we also carry Pillow Block Bearing, Shaft Collar, Bearing, Spindle Assembly and many other products. Here at Jeremywell our goal is to deliver the best value products with excellent service to all of our customers. We believe by consolidating all the mechanical products to one easy and hassle free online shopping site will make your purchase experience more enjoyable. We believe our superior quality, excellent customer service and competitive price will be at your satisfaction! Please feel free to message us if you have any questions or concerns of our products. All the applications indicated in this posting are for reference only. If you are not 100% sure this is what you need, please find out the part number or model number and message us to confirm before your purchase.